Did you know that $209 million was paid to ransomware criminals in 2016? 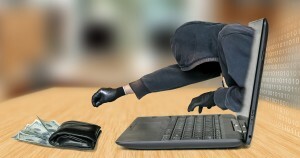 Evil cybercriminal thief – hacker steals money from businesses and organizations. increasingly tougher-to-prevent monetizing cyber attacks. For businesses who become victim to ransomware attacks, the consequences can be devastating — ransomware that lands in some shared locations within networks can literally paralyze an organization’s operations. Therefore it is critical for organizations and companies of all sizes to become knowledgeable about preventing and defending against such attacks. Install security software and maintain that software. Ensure antivirus is installed and up to date throughout the business. Perform regular backups to an external medium (external hard drive or the cloud) and backup all your data every day. After backing up, disconnect your drive. Current ransomware is known to encrypt your back up drive as well. Restrict administrative rights; only give crucial access if necessary. Use strong passwords. Promote a social media policy that limits work-related information, such as keeping job titles from being posted on social media. Conduct ongoing training to ALL employees about how to recognize and avoid Ransomware. Perform random checks to make sure employees are adhering to the rules. Avoid Phishing emails. They usually send an attachment such as URGENT ACCOUNT INFO with a file extension of .PDF.zip or .PDF.rar, which slips by the unsuspecting victim and delivers the payload. This attack often encrypts the entire hard disk. Instruct ALL employees to NOT open emails in the spam folder or emails whose recipients they do not know. Instruct ALL employees to NOT open attachments in emails of unknown origin. DO NOT pay the ransom. The reason why the criminals keep utilizing this form of blackmailing attacks is that people keep paying. To try to get your data back, consult a professional in your area. Previous Previous post: Will Your “At-Will” Disclaimer Protect You from Wrongful Termination? Next Next post: Are You Throwing Money Away on Wrong Hires?